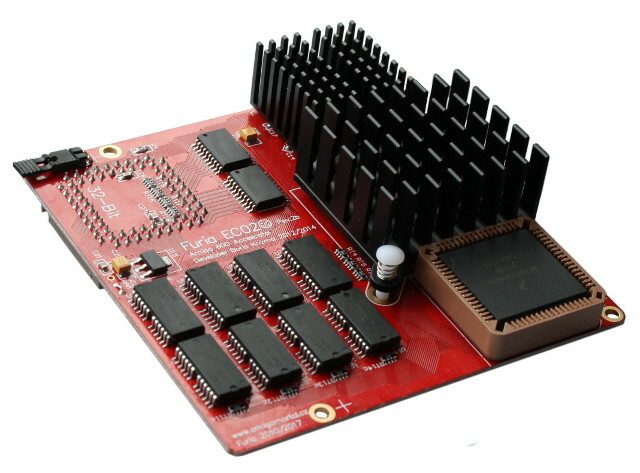 Furia EC020 is an accelerator card for Amiga 600 computers. It is equipped with a Motorola MC68EC020/33 MHz CPU (and a Motorola MC68882/40 MHz FPU on the FFPU version), furthermore it features 9.5 MB of on-board fast memory. The quick access to the memory makes this little card a real monster, as it makes the Amiga 600 more than ten times faster compared to a stock model. The card also has the ability to map the Kickstart ROM into the Fast RAM. This was tested with ROMs of 256 kB, 512 kB and also 1024 kB size. The card also speeds up data transfer over the Amiga 600's internal IDE port. The Furia EC020 card is easily controlled by the tool FuriaTune. To be able to access the computer's PCMCIA port, you need to remove 4 MB of the Fast Memory by pressing Control+Amiga+Amiga for three seconds. There are no fitting poles included with the delivery. The Furia socket is heavy duty - in contrast to the socket used on other cards. If you fit furia on the CPU, you will be able to lift the Amiga holding the Furia card in your fingers. In order to obtain highest compatibility, original CPUs by Motorola and DRAM chips were used. These chips are no longer produced nowadays, but the ones fitted on the Furia card are NOS ("new old stock"), i.e. unused. The types used may vary. Every card is tested with MBR2 test for two hours with heatsink covered. in a Shell window and you will get list of its options including a simple description. The FuriaTune tool should work on all Amiga operating systems including AmigaOS 1.0 and is tested up to AmigaOS 3.1.